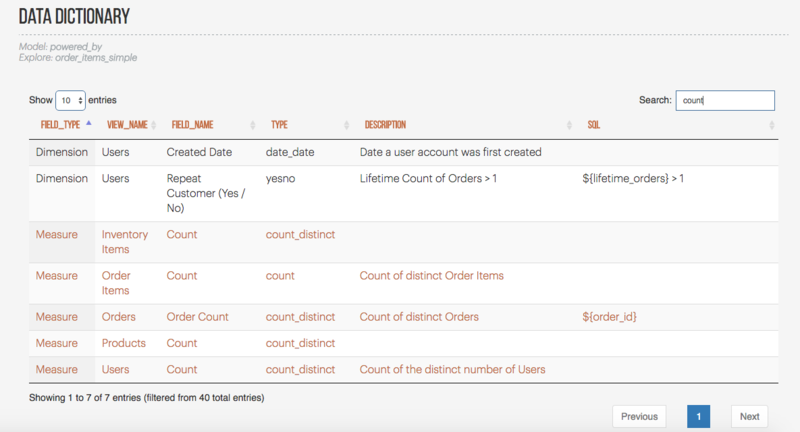 The Data Dictionary block pulls up metadata about fields built within the Looker Model (by using the lookML_model_explore API call) and displays the fields in a digestible format that provides transparency about metric definitions. The definitions are based on dimensions and measures in the LookML model, including the data type, description of the metric, and the associated LookML sql parameter. Format the results from the lookML_model_explore call using custom CSS and HTML. Consider using JS Plugins to allow for Search and Sort functionality to make the dictionary more accessible. In this block, we use the DataTable JS Plugin.